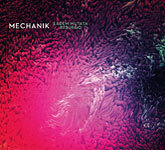 MECHANIK is a Spanish experimental space-kraut-prog-rock formation featuring Klaus, Lete G, Olivares, Yuldj, and Bocho. It emerged in Madrid in late 2011 and, as the band’s official bio states, “was fed up on low frequency bass vibrations, ear-piercing guitar shrieks, electronic intonarumori… grew defiantly and eventually detached itself to vibrate away into deep space”. Three digital EP’s of "psychokraut" music were shot back to Earth in 2012. Those were diverse and amazingly deviant transmissions which couldn’t be ignored by R.A.I.G. (and “the Dogon people”, as spectators say)… Follow MECHANIK on Facebook. "Eadem Mutata Resurgo" is the second full-length album by MECHANIK from Madrid. It includes all new, mostly instrumental compositions performed and recorded by the combo of Lete (drums, percussions), Tasio (bass, effects), Yul (electronics), and Klaus (guitars, effects, voice) at Headroom studio. The album is conceived as a non-stop and psych-out transmission with the tracks organically flowing into one another. It's darker, more experimental and courageous work in comparison with the band's previous album. Yet it will fully satisfy lovers of motoric, groovy, rich and intricately textured trippy space-kraut-rock fueled by the themes of Death, Mysticism, Gnosticism, Time Travel, Drug Abuse, Spiritualism, Outer Space, Decadence, etc. (8 tracks – 53 min.). Free streaming or immediate digital download of the album (MP3, FLAC or other formats) is available through Official R.A.I.G. Bandcamp. "Eadem Mutata Resurgo is a thing of wonder, it brings something new to the psych scene; a creativity not oft seen. Each track is embued with an atmosphere of its own, some reminiscent of krautrock forefathers, some scatological musings on space...but it's 'Howl' to which I'm drawn back - the marriage of an iconic poem with some top grade psych is truly inspired." – by Andy Uzzell at Dayz of Purple and Orange (UK) (October 2015). "Very impressive… Mechanik have created a genuine album that must be heard from start to finish to be fully appreciated." – by Jerry Kranitz at Aural Innovations (USA) (December 2015). More reviews: Rockblog.Bluesspot (Germany), New Underground Music (The Netherlands), Babyblaue Seiten (Germany), Musikreviews.de (Germany), DisAgreement (Luxembourg). 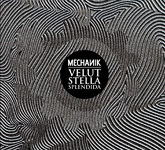 "Velut Stella Splendida" is the first official full-length album by MECHANIK. All tracks were recorded, mixed, and mastered at Headroom Studio, Madrid in winter-spring 2013. "Wherever You Are Is The Entry Point", "In The Faith That Looks Through Death", "Pills", "Zum Traum", and "Most People Were Silent" are newly composed tracks; the original versions of "De Tepenecz", "Inner Temple", "Bliss & Gloss", and "Russian Doll" appeared on the band's three EP's of 2012. Words by Francois Rabelais, William Wordsworth, Julius Robert Oppenheimer, and La Sue. Artwork by Javier Martinez Zancada. (9 tracks – 76 min.). This transmission is a must-heard for all space-travellers, kraut-adventurers, and psyche-lovers! Free streaming or immediate digital download of the album (MP3, FLAC or other formats) is available through Official R.A.I.G. Bandcamp. "I got what I wanted; delivered and delivery. Velut Stella Splendida takes more than its name from an early EP. Made up of new cuts, and revisits to earlier trips, Mechanik’s full-length uses that wiggle room to maximum effect... De Tepenecz, Inner Temple, Bliss & Gloss, Russian Doll and partial Pills get some new limbs here, opening to full wing-span. De Tepenecz, like new cut Zum Traum, tips the collective hat to earlier Floydisms. The obvious difference is that Zum Traum quickly discharges the cascading Syd-era sparks to fully ignite into a driving, determined and indefinite juggernaut, not unlike the album’s start with Wherever You Are Is The Entry Point and In The Faith That Looks Through Death‘s vibrating and rubbery drive. Pills, birthed earlier with Did You Have To Take So Many Pills?, retains the sense of humor but gets a new body more suited to moving with the rest here. Both the revisits and the new songs stand as equals; neither are filler to the other. There’s no mistaking Velut Stella Splendida as anyone other than Mechanik, but their mixing of those two ingredients make for a fuller Mechanik, one that seems to fly a bit higher and coast a touch easier all the while taking on some weight, or at least casting a bigger shadow. They also can let out a bigger breath, or hold it in while it’s being patiently replaced, as they show on the more recent Most People Were Silent. The lengthiest outing here at 22 plus minutes, Mechanik strip down their suits to the essentials and forgo any finish line in pursuit of a tranquil departure. Before they leave though, Mechanik leave this space refashioned and still undisturbed, explored but not exhausted. If you’ve been consuming the earlier EPs, Velut Stella Splendida is the full course meal you’ve been waiting to savor. Space and krautheads alike will fully devour their plate, and even members of those camps that somehow feel the need to be mutually exclusive will end up sitting on each others’ laps, rather just pulling up a seat next to each other." – by Mr. Atavist at Sunrise Ocean Bender (USA) (October 2013). "There’s lots of variety on the album though not so much that Mechanik stray from a sense of cohesiveness. I especially like the tracks where the band create adventurous space rock that is also highly accessible, something I think can be a challenge to do. This will be a strong candidate for my best of 2013 list." – by Jerry Kranitz at Aural Innovations (USA) (October 2013). "Besides the high quality production, the best compliment I can give Velut Stella Splendida, despite the fact that it might sound repetitive for people outside the krautrock circle, is that it managed to keep someone who isn't usually interested in this type of experiences hooked in for the majority of the journey. (Conclusion: 7.5 out of 10)" – by Diego Crescini at DPRP (UK) (July 2014). "Velut Stella Splendida is an eighty minute, supercharged blast into the cosmos that immediately draws the listener in from the gradual, tension building thunder of opening track 'Wherever You Are Is The Entry Point' and climaxes with the almost twenty three minute 'Most People Are Silent'. These guys definitely like to stretch out, with only one track clocking in under five minutes. Their sound draws from the early space rock explorations of Pink Floyd, but with an even heavier focus on the synthesizer and guitar, which drives the majority of these compositions. Throbbing bass lines are often combined with steady and repetitive drum patterns, as employed in the past by such krautrock pioneers as Can and Neu!. (Score: 4 of 5)" – by Ryan Sparks at Sea Of Tranquility (USA) (January 2013). More reviews: Musikreviews.de (Germany), New Underground Music (The Netherlands), Glorious Space Riders (Hungary), iO Pages (#120) (The Netherlands), Babyblaue Seiten (Germany), Psychotropic Zone (Finland).